Just a short post today, so I can gloat for a minute over this lunch I threw together the other day. Jon and I were both home, we hadn’t done our grocery shopping yet for the week, and there was a bunch of rapidly wilting beet greens in the fridge that I was assuming I’d have to throw out. But wait! There was sausage in the fridge as well! The week before we’d had a simple supper of Uli’s linguica sausages with tabouli, and there were two left – hurrah! I can always work with sausages and greens. 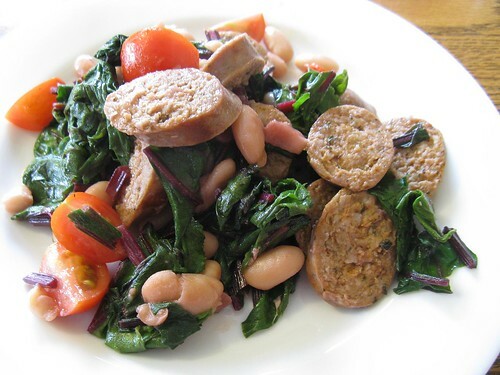 All I did was chop up the beet greens (we ate the beets last week), saute them in olive oil with some sliced garlic, toss in a can of Progresso cannellini beans and stir it all up, then I cooked the sausages in a separate pan, sliced them and added them in. I found a few ripe Stupice tomatoes on the vine on the deck, and sliced those in as well – wow, they were good. Tiny, but powerful. We ate it all up in the kitchen with a glass of wine, with rain pouring down outside (ah, that balmy August weather). Gave us the strength to go grocery shopping. good food and good wine…should always give one strength!